Gaffer’s Restaurant on Ocracoke Island is your go-to destination for great food and fun. Serving up breakfast, lunch and dinner daily, we offer a wide variety of reasonably priced and delicious choices. There is something for everyone, ranging from chicken wings and vegetarian nachos to porterhouse steaks and fresh, local Outer Banks seafood. Gaffer’s Restaurant also features creative daily specials and a full kids menu. Plus, there’s no better place on Ocracoke Island to catch a game. We have plenty of TVs, two bars and ample seating. There’s not a bad seat in the house! You will be hard pressed to find a better Outer Banks live music venue than Gaffer’s Restaurant. Ocracoke Island's premier destination for live music, Gaffer’s offers up live shows nearly every night of the year – featuring bands from all over the east coast. But, Gaffer’s also serves as a home base for the island’s favorite local musicians. Catch performers of nearly every genre, including southern rock, jazz and reggae. What’s more, Gaffer’s is one of Ocracoke Island's few full service bars! Our offerings include specialty cocktails, craft beer and wine, and daily drink specials. 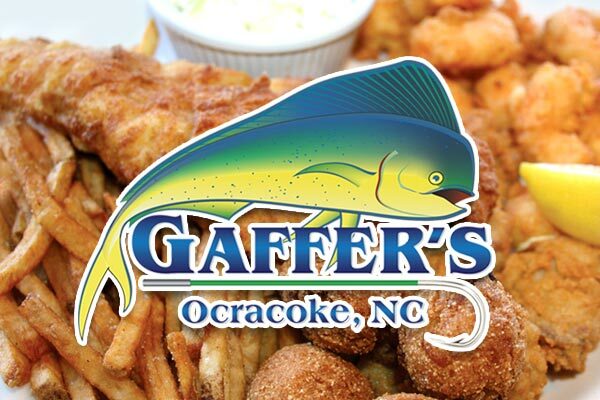 We look forward to seeing you at Gaffer’s on Ocracoke Island!